Since moving to Sweden in 1987 on an exchange program with UCSD a favorite pastime has been exploring my new home country. To that end I have dragged my wife, children and in-laws to the arctic North in both February and June and most of the rest of the country in spring and summer when we have explored the back roads, small towns and nature and I can safely say I have seen a lot more of Sweden than most Swedes, who take this fantastic country for granted. So it was I was quite surprised when I discovered a new treasure only a short distance from our home. 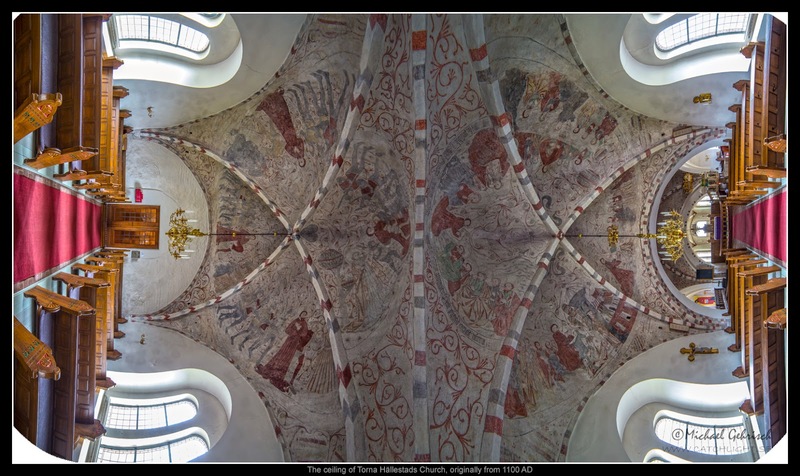 In any case it is impressive; the architecture, the vaulted ceilings and most of all the paintings on the ceilings, which I later learned painted around 1460 by a Swedish artist named Nils Håkansson and called "Vittskövlemästaren" - "The Master of Vittskövle". Ideally you should now hold your computer monitor or at least your iPad over your head to get the proper effect. Moving on to the crossing of the transept I shot the 360 degree panorama (26 shots) you see below. There is some HDR processing to be able to recover both the shadows and highlights since it was a bit dark in the middle of the church, but with bright light from the windows. 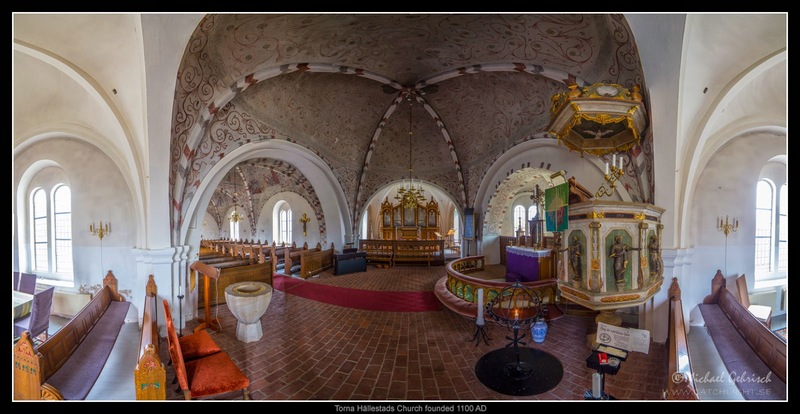 And finally moving to the transept I shot the 210 degree panorama below which shows a bit more ceiling detail. While it might not be fair to compare this to the Sistine Chapel, considering that people are willing to travel thousands of miles and spend enormous amounts of money to visit Rome, Torna Hällestad Church deserves a good deal more attention from both Swedes and visitors, so the next time we have visitors we will definitely make a stop here. Makalösa bilder, tack för tipset. Hade inte en susning om freskmåleriets kvalitéer här. Har däremot tidigare fotograferat och förundrats över de infogade runstenarna, där hednatidens främsta symboler möter Helighetens hus. Man använde väj byggnadsmaterial överallt det dök upp, misstänker jag. Apropå ingenting. Medan jag hyser den största respekt för ditt kunnande så har jag ändå bestämt mig för att lägga ner projektet. Jag får boka in mig på en specialresa istället. Stort tack för ditt engagemang, Michael.